Discreet yet distinctive, sporty yet modern, the Vanguard Tourbillon Skeleton claims its new look through the clever appearance of its skeleton body. The bridges hand-polished to perfection reveal the manufactured movement of the watch in its entirety. Wholly designed and manufactured in-house, the balanced design of the Vanguard Tourbillon Skeleton showcases the passion for crafts and art of details characteristic of the Franck Muller manufacture. The open-worked bridges have been designed to accentuate the architecture of this piece, which is very strong. The upper bridge of the tourbillon adorned with the initials of the brand brings this timepiece to life. The VanguardTM Tourbillon Skeleton is housed in the emblematic Cintrée Curvex case, with an integrated bracelet and is available in titanium, carbon, stainless steel and 18-carat gold. 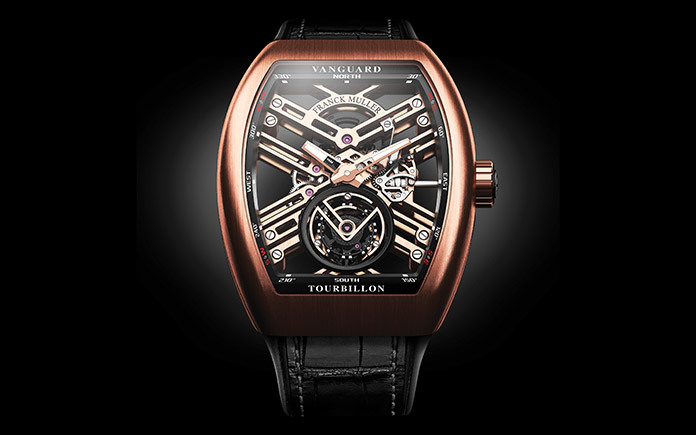 With the architectural lines of its movement, the VanguardTM Tourbillon Skeleton is a resolutely contemporary timepiece.